Welcome to the website of the ARIANNA Collaboration. 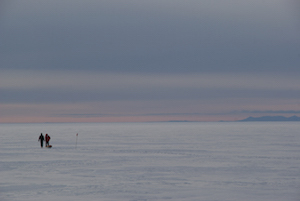 Set in the Antarctic, ARIANNA is an exciting new experiment that pushes the boundaries of UHE neutrino physics to new limits, attempting to understand some of the most fundamental characteristics of our universe. The experiment is currently in its pilot phase and this website a hub for the collaboration as well as the interested public.